Dylan Van Tassell is the first state champion for Ohio Hi-Point’s DECA program at Triad High School. 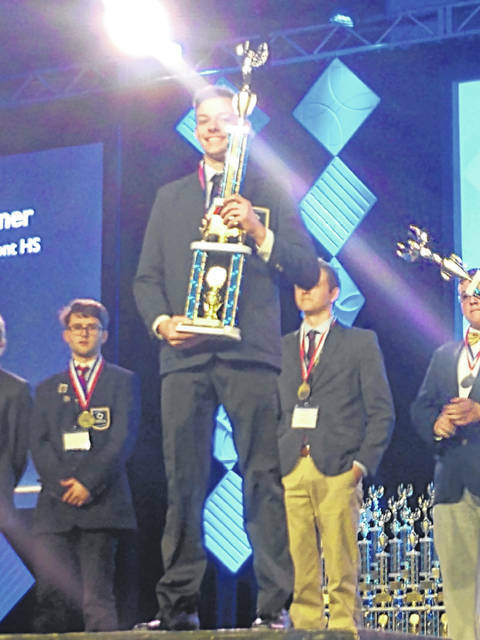 BELLEFONTAINE – Dylan Van Tassell, an Ohio Hi-Point Supply Chain Management student at Triad High School, won the Personal Financial Literacy event at the Ohio DECA Career Development Conference. He is the first state champion for Ohio Hi-Point’s DECA program at Triad High School. Van Tassell, along with 19 other students, represented Ohio Hi-Point and Triad High School in a variety of category events like business, finance, marketing, and business law. Nina Hestermann and Elijah Carson placed in the top 10 in the state in Professional Selling and Accounting Applications, respectively, while the team of Sabrina Quintero and Aliyah Ater advanced to the finals for their work with the DECA Depot, Triad High School’s student-operated coffee shop. Van Tassell will compete at the DECA International Career Development Conference in Florida in April. In addition to the Triad DECA chapter competing, Ohio Hi-Point’s DECA Chapter at Urbana High School also competed. Dalton Sexton competed in the Principles of Marketing category and Raegan Bartee and Andru Troyer competed in the Team Marketing Management. The DECA chapter students are part of Ohio Hi-Point’s Supply Chain Management satellite programs at Triad and Urbana High School. The instructors are J.J. Martin and Ashley Cook, respectively. Submitted by Ohio Hi-Point Career Center.